The F-117A Nighthawk is the world's first operational aircraft designed to take advantage of stealth technology. The unique design of the F-117A gives it exceptional combat capabilities. The aircraft is powered by two General Electric F404 turbofan engines and has quadruple redundant fly-by-wire flight controls. The F-117A can utilize a variety of weapons and is equipped with sophisticated navigation and attack systems integrated into a state-of-the-art digital avionics suite. Detailed planning for missions into highly defended target areas is accomplished by an automated mission planning system developed, specifically, to take advantage of the unique capabilities of the F-117A. The first F-117A was delivered in 1982, with the last delivery in the summer of 1990. 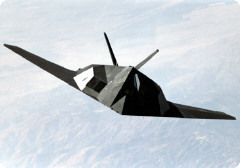 The F-117A production decision was made in 1978 with a contract awarded to Lockheed Advanced Development Projects, or popularly known as the "Skunk Works," in Burbank, CA. The first flight of the F-117A was in 1981. The F-117A operates out of Holloman Air Force Base, NM. Page rendered on 25 April 2019 at 00:52:22 in 393.867 microseconds.